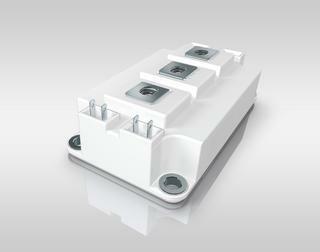 SEMIKRON IGBT modules are key components of power electronics in wind turbines (WT). 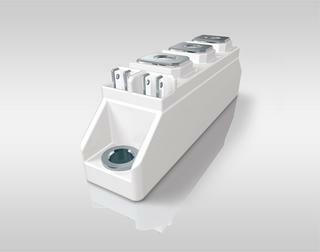 The innovative mounting and connection concept enables good temperature and load cycle stability as well as good reliability and durability. 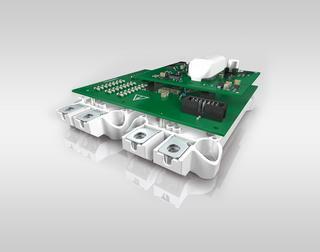 The intelligent power module series SKiiP3 and SKiiP4 include integrated drivers, monitoring and protective functions, and cooling. 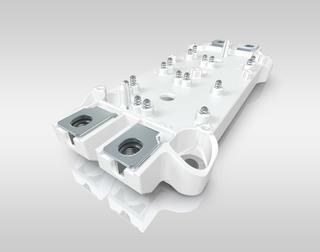 SEMIKRON uses these modules to manufacture products which stand out due to their high power density and ease of use. In the power electronic SEMISTACK subsystems, SEMIKRON combines SKiiPs with DC link capacitors and low-inductive busbar to make complete power output stages that are ready to install. 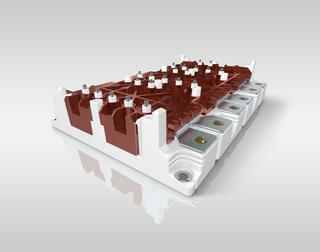 Owing to the high outputs of today's WTs (over 2 MW), water cooling of the IGBT modules is common. One particular challenge for power semiconductors is the need to cope with a grid fault for a specified period of time (Fault Ride Through), a feature demanded from WTs by network operators. In WTs with doubly-fed asynchronous generators in particular, the IGBTs and freewheeling diodes must be able to cope with high peaks in current and voltage in such instances. Synchronous generators with a full power converter are used more frequently in wind turbines, as these make it easier to support the network during FRT. The system can be controlled directly, supplies optimum synchronisation at the line frequency of 50 or 60 Hz, and can both compensate for harmonic reactive power and generate displacement reactive power. Moreover, synchronous generators with a large number of poles (> 50) can be manufactured so that gears are no longer required in the powertrain; historically, damaged gears are one of the most frequent causes of failure. 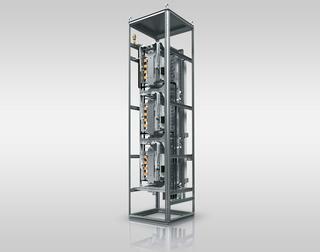 The features of these are similar to those of WTs with synchronous generators. Asynchronous generators are significantly cheaper and more lightweight than synchronous generators but, on the other hand, they are less efficient. 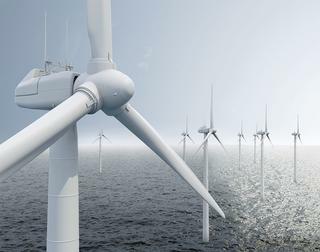 Around 80 per cent of regulated wind turbines installed so far worldwide operate with a doubly-fed asynchronous machine, which is controlled via the rotor current by means of the converter. The advantage of this solution is that the majority of the current is fed directly to the grid without being converted, and the converter only needs to regulate around 1/3 of the plant output. However, disadvantages include the slip ring contacts, which require regular servicing, the restrictions on min and max speed (70 – 130 per cent), and the FRT behaviour mentioned above. 2-quadrant full power converters for synchronous generators with permanent magnet or electrical excitation represent a reasonably priced, efficient converter topology for synchronous generators. 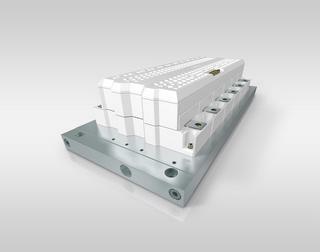 As simple rectifiers are used on the generator side, the system requires fewer IGBT modules and corresponding control units. Disadvantages include increased machine losses due to the need for induction current, and harmonics caused by the uncontrolled rectifier. The 4-quadrant full power converter has now become the most widespread topology in the WT field. This topology – with varying dimensioning – can be used for all three generator principles mentioned. 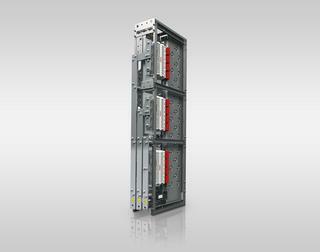 4Q converters make it possible to achieve minimum machine losses and the maximum range of control. Through reactive power control of the generator current, it is possible to utilise the generator comparatively efficiently over a wide range of speeds. If necessary, the full reactive power can be made available, even in low wind conditions.